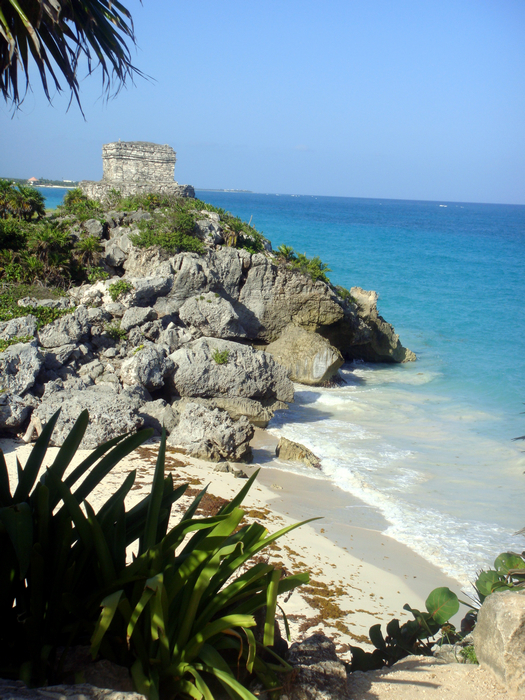 When I woke up this morning, I ran to the balcony to check out the weather and crossed my fingers for sunny weather! It was beautiful out; perfect day for adventure. 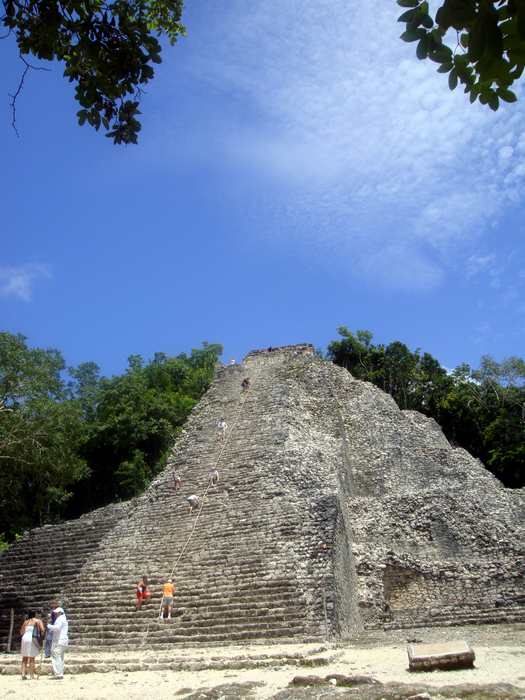 I really need the great weather because today I booked a tour to climb the Mayan ruin – Coba and visit the only Mayan site near the water – Tulum! 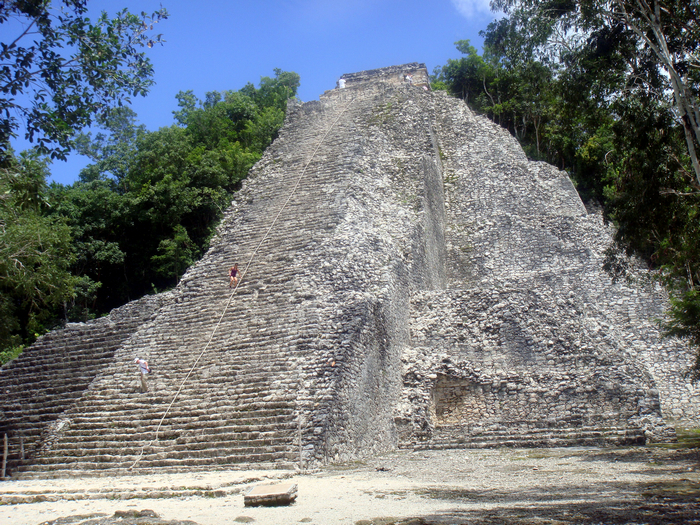 The logistics were the same as Chichen Itza. We waited for the hotel pick-up bus in the hotel lobby around 7:10 am and once we dropped off at Plaza la Fiesta, I immediately ran to the back counter to get our tickets. This time we were in the front of the line 🙂 We boarded the bus, it turned out to be a full bus again! Our bus stopped at one of the natural water parks and then people split up for different tours. We boarded a van this time since our group was relatively small. 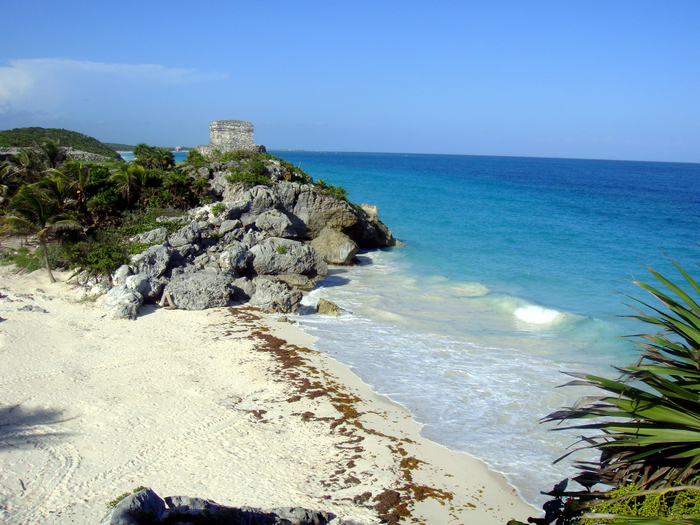 There were a total of 2 vans for the same Coba + Tulum tour, total less than 20 people. The van was clean and very comfortable. 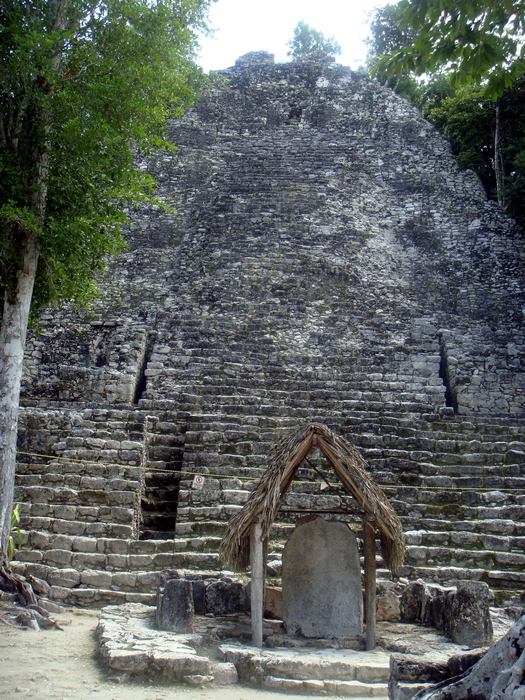 In an an hour and a half or so we arrived at Coba! When I got off the van, I saw few souvenir shops and then the entrance to what it looked like a forest – time for insect repellent spray! 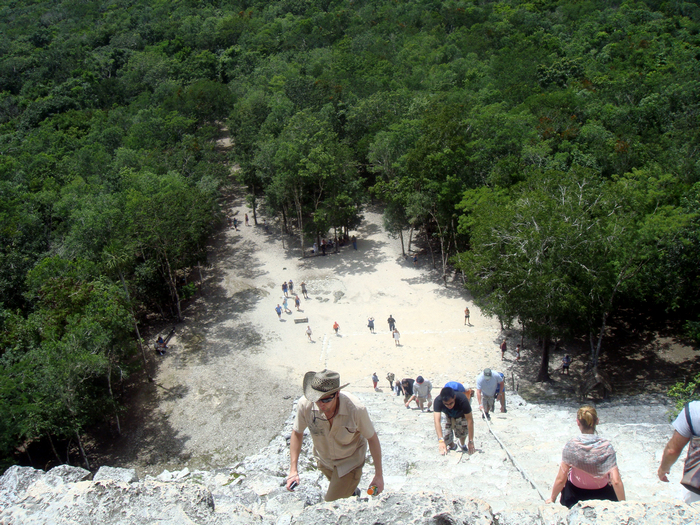 Our tour guide got our tickets and off we off, we hike into Coba! 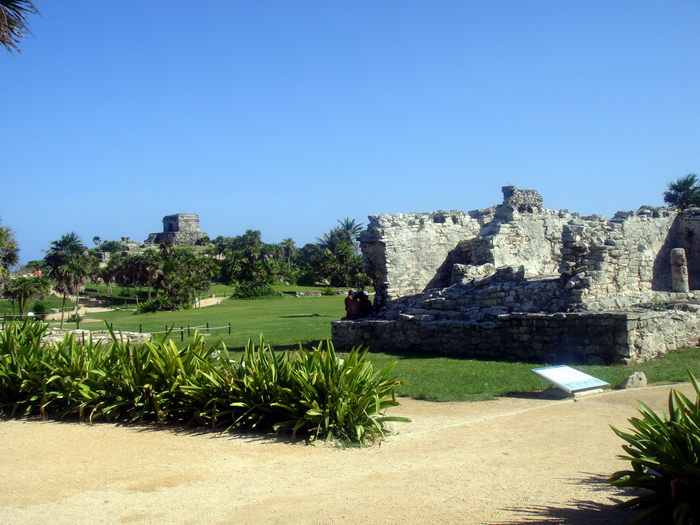 Within minutes of walk, we saw the ruins already! 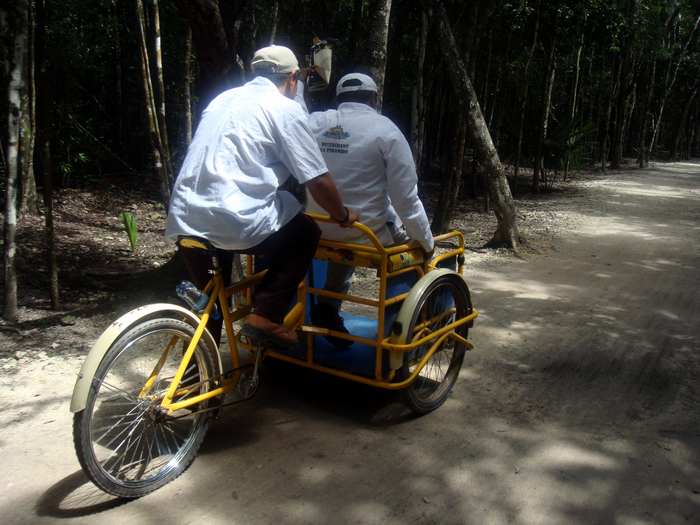 It was really fun to be in the tricycle, we breezed through the forest while some of our group members were still walking. 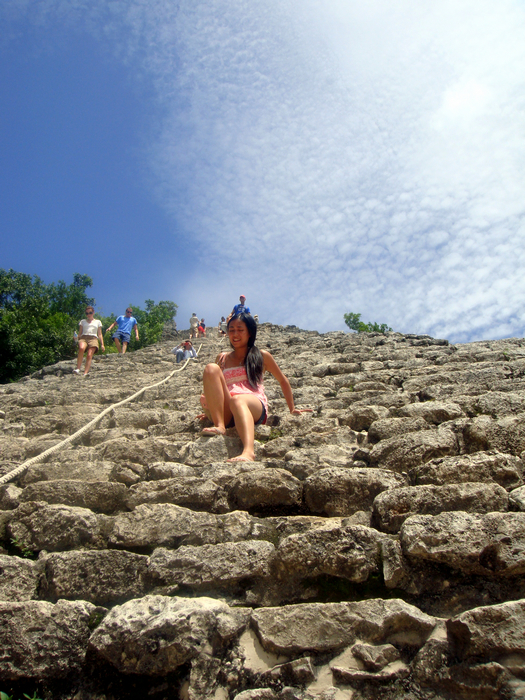 I rather saved my strength to climb the pyramid haha! We were there early in the morning and the walking trail had trees on both sides so it was warm – not hot! 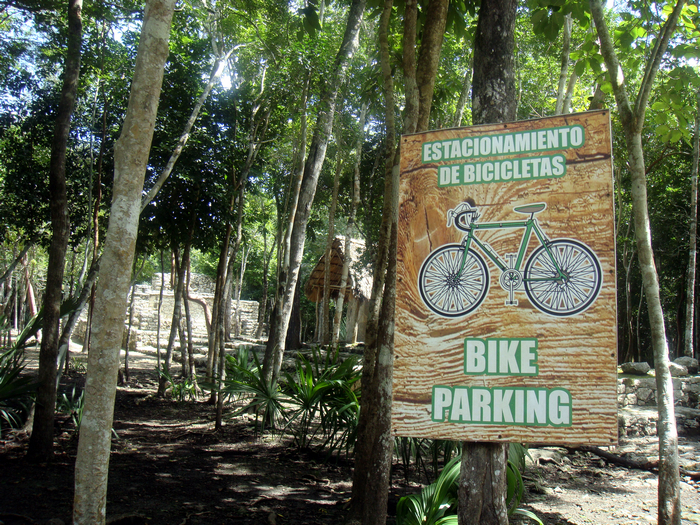 We passed by many bike riders and there were parking places for bikes too! 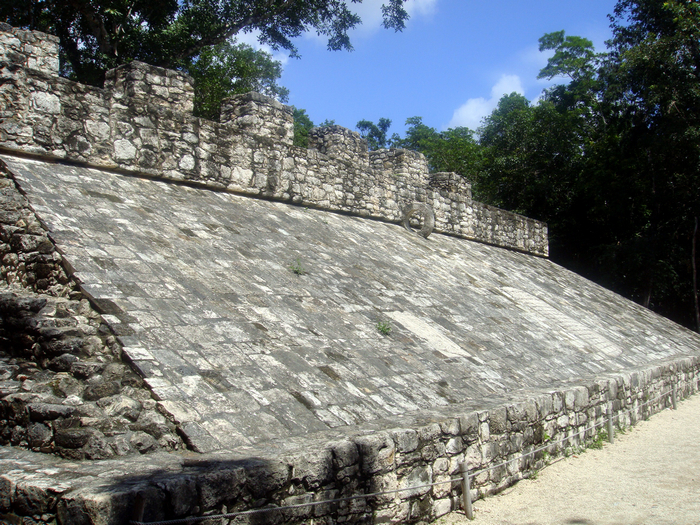 We heard about the same story about the ball court in Chichen Itza but this time we were very close to see the “ring” of the ball court. 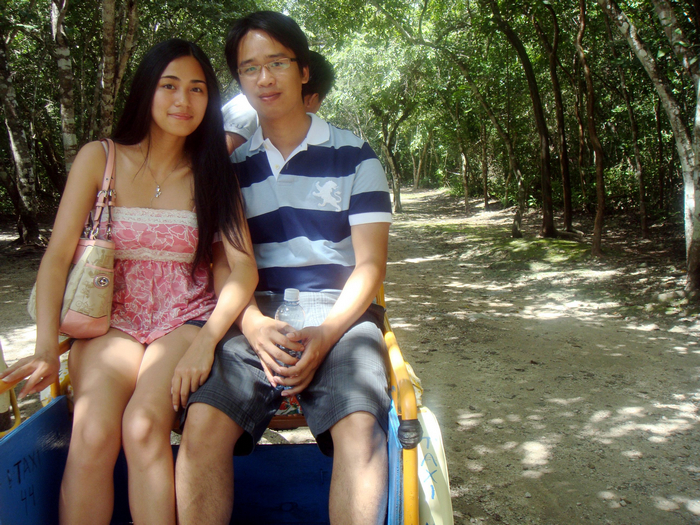 We hopped back to our tricycle again and continued our way! 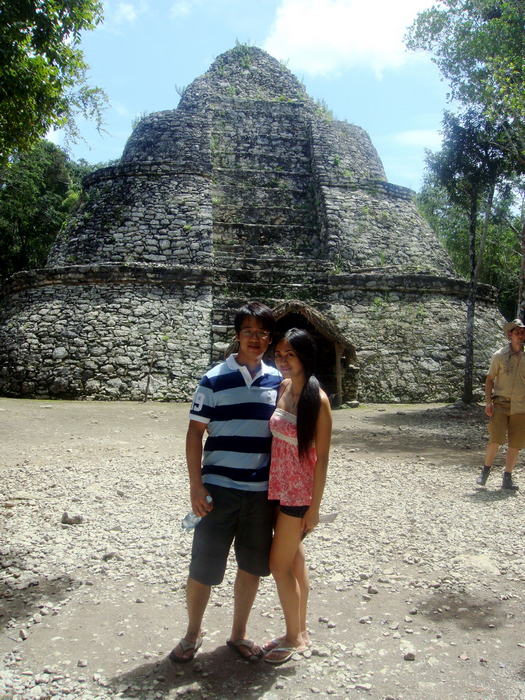 We hopped back to our tricycle again and next stop – Nohuch Mul pyramid!!! It was taller than I thought! 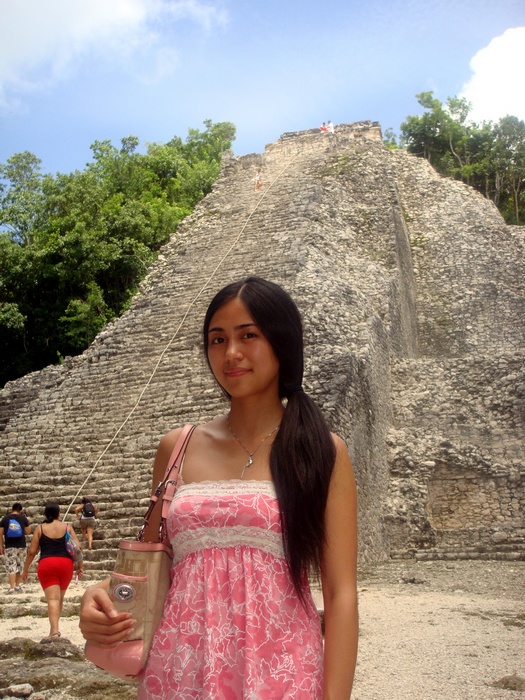 At 138 feet high, this is the tallest pyramid in the Yucatan Peninsula! 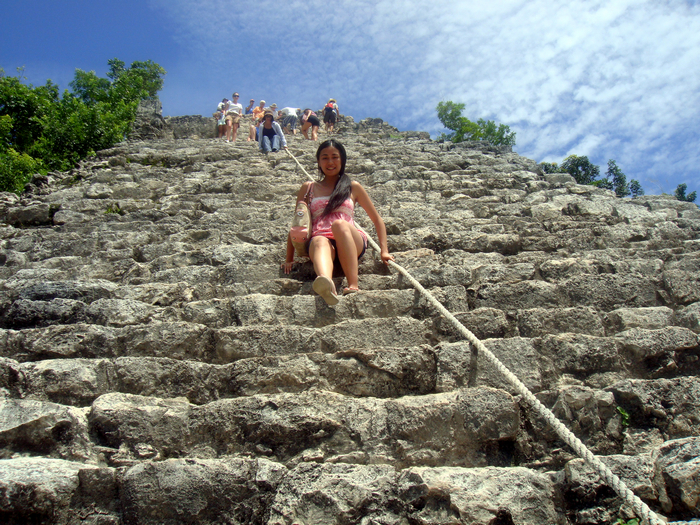 There is a total of 120 steps and the steps were very narrow and steep so recommended to hold onto the rope when climbing the pyramid. Alright..the time has come – time to climb!!! 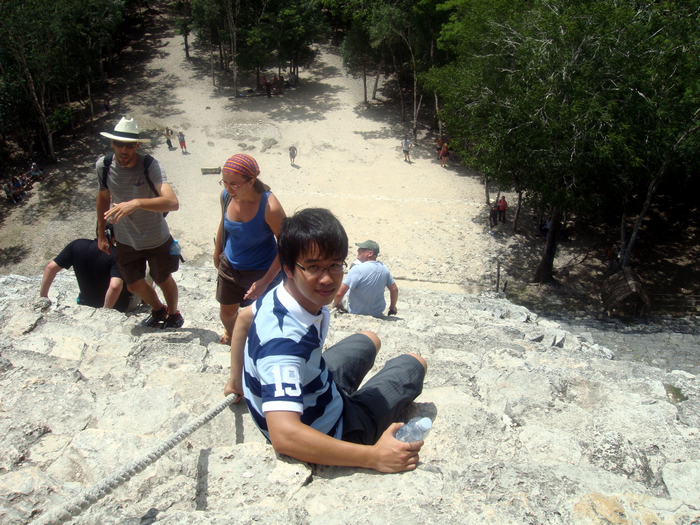 Climbing up was not too bad, see I was still smiling! Some of the steps were very slippery so be cautious!! Stop and rest if you need to and don’t forget your water! We were almost there to the top! 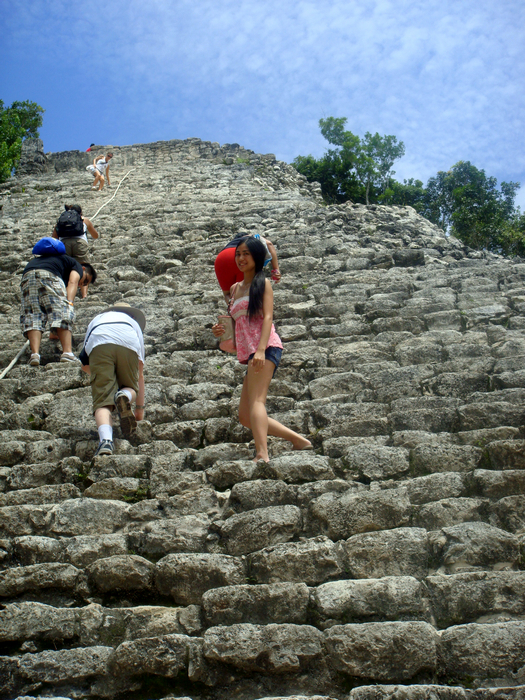 We officially climbed the pyramid wohooo!!! I had my husband to take this picture because it was very steep and as I mentioned before, I am acrophobic!!! 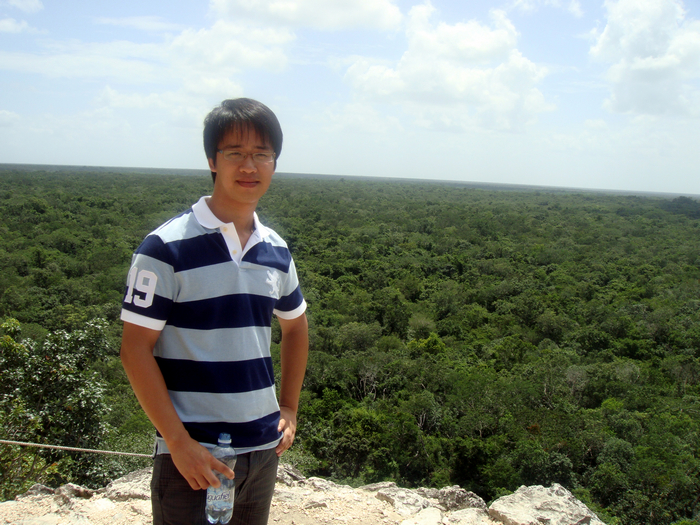 We can see the whole jungle from up here since this is the tallest structure! The view was incredible! After some rest to catch our breathe, we were ready to go back down! The way down was much harder than the way up!!!! 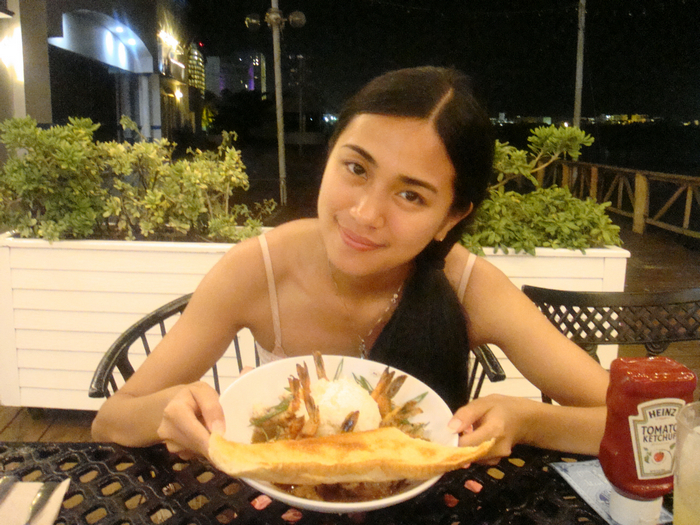 My hubby got down very quickly and had fun taking picture of me…. I finally got down yay! 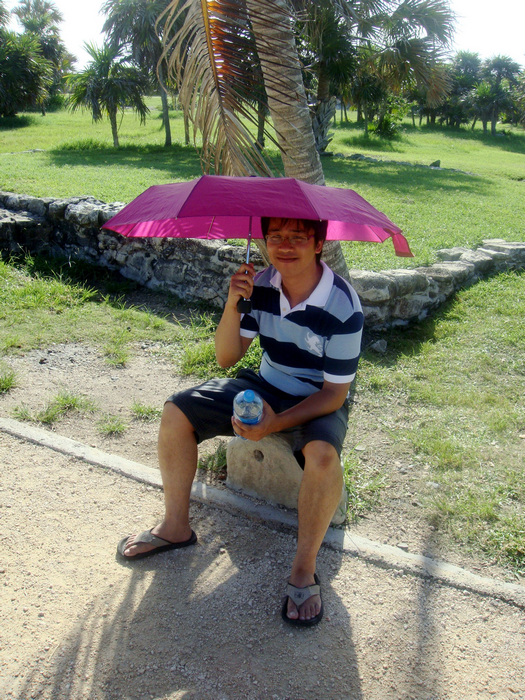 I was so thirsty and good that the locals were selling iced-cold bottle water there! The price was reasonable around 30 pesos for a big bottle! 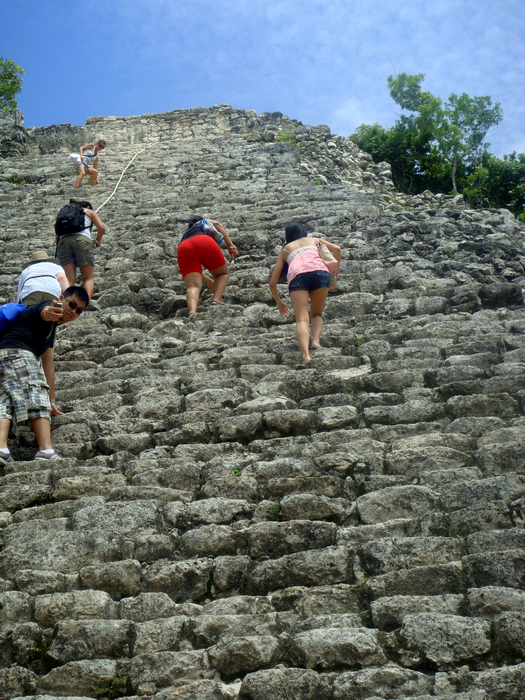 On the way back out, we felt that our 75 pesos was well spent; after our pyramid climb, no way we want to walk the 1.5 miles back out!!!! A lot of our tour members who walked all the way to the pyramid ended up taking the tricycle back as well! We went back to our van and felt so good with AC!! 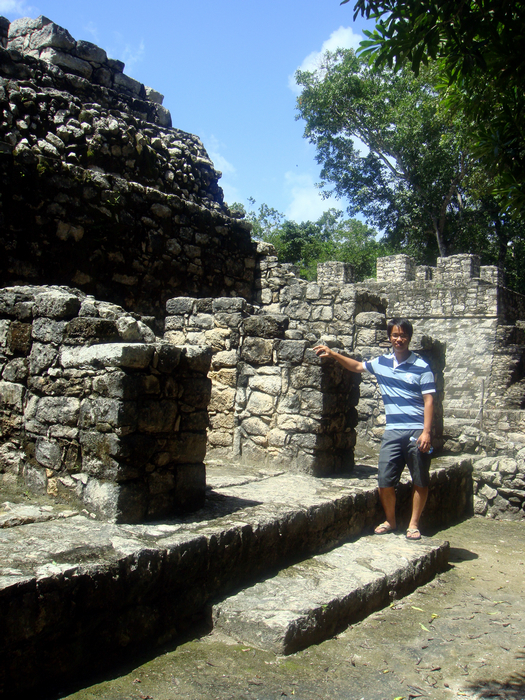 Just few minutes drive out of Coba, we stopped to have our lunch which was included in our tour price. We went in this very cute family run restaurant. The food just ready, it was buffet style as well, not as much choices as the one we had in Chichen Itza but the food was pretty good! 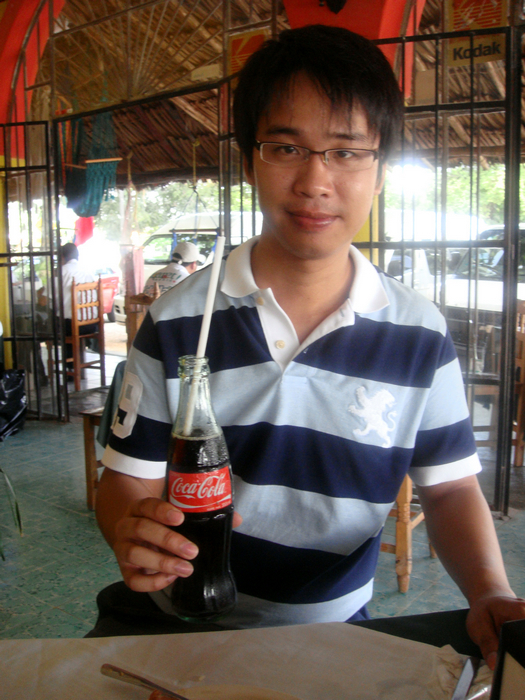 Soda was 10 pesos so not bad! 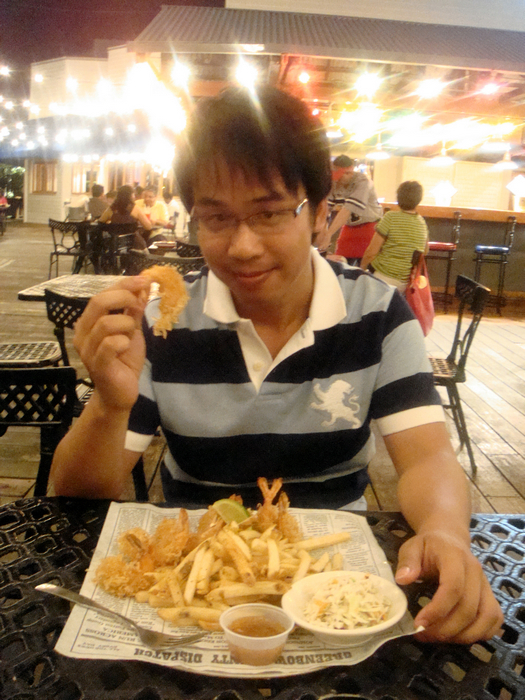 The restaurant had a souvenir shop too. 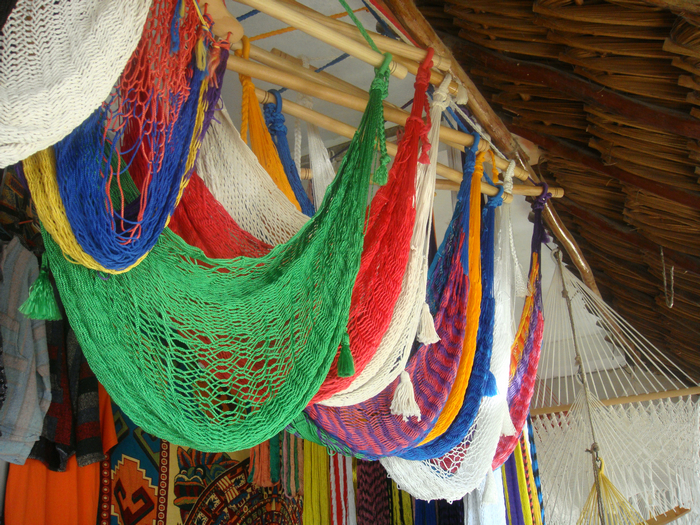 I really like this picture, very colorful! 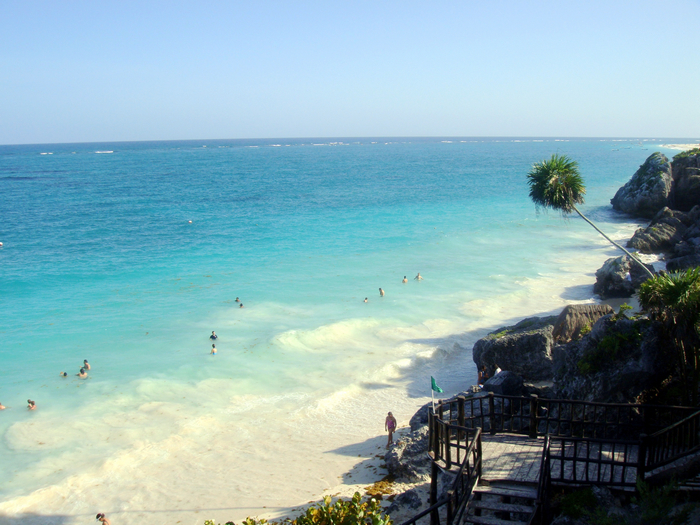 Tulum! 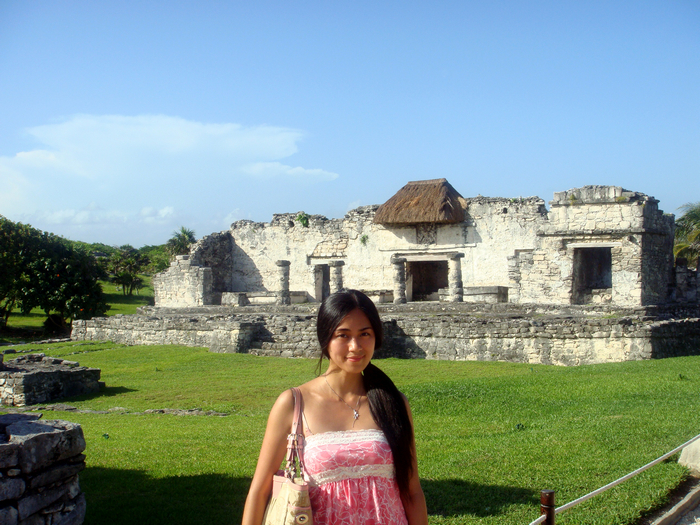 It was such a beautiful ruin! 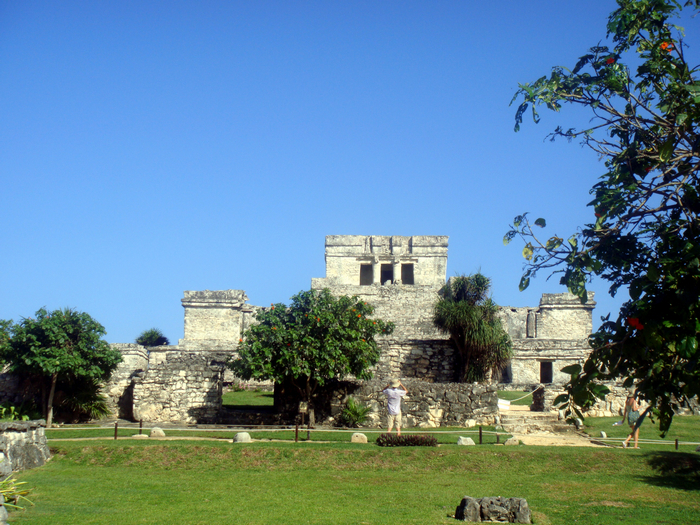 Tulum was the only “organized” city of the Mayans, there were streets instead of scattering around. 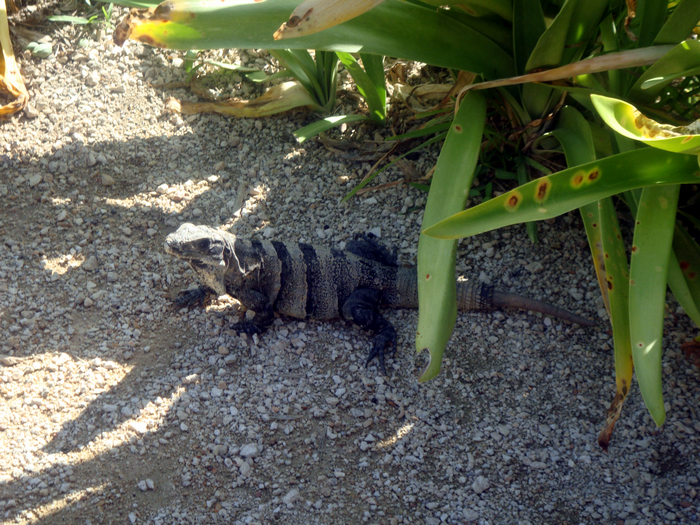 There were large iguanas all over Tulum! 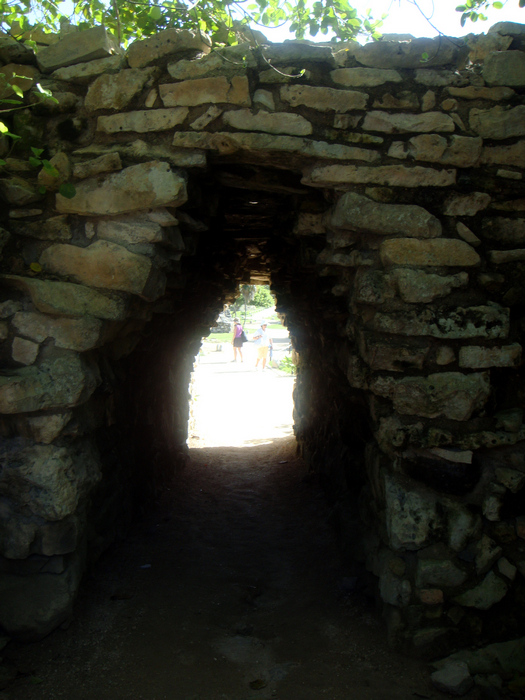 The structures in Tulum were gorgeous! 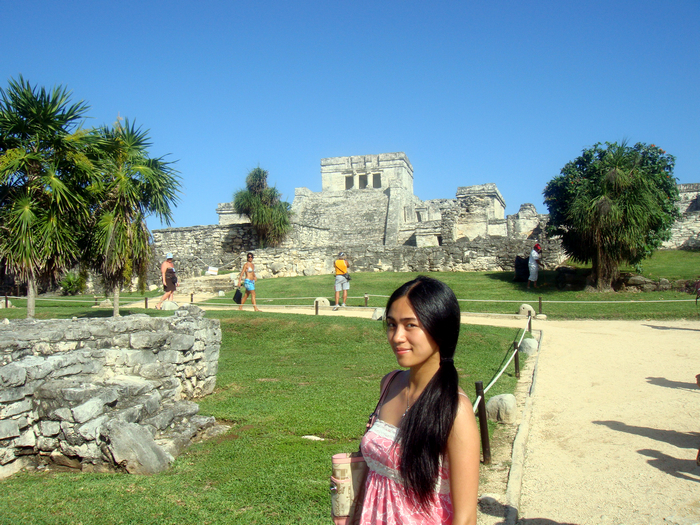 Tulum is my favorite Mayan site out of the three we visited! 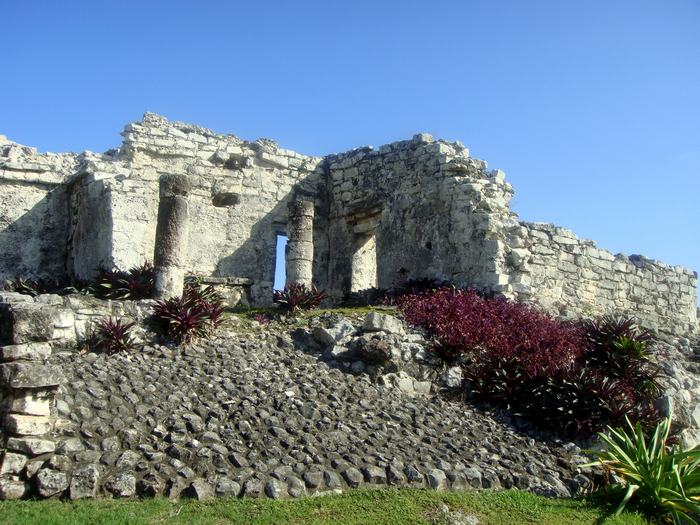 We had around 1.5 hours to freely explore the ruin. 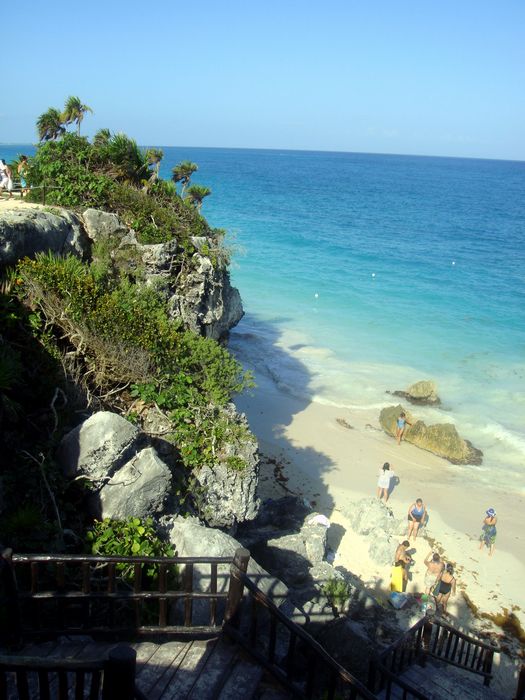 We headed to the beach area and the beach was beautiful! 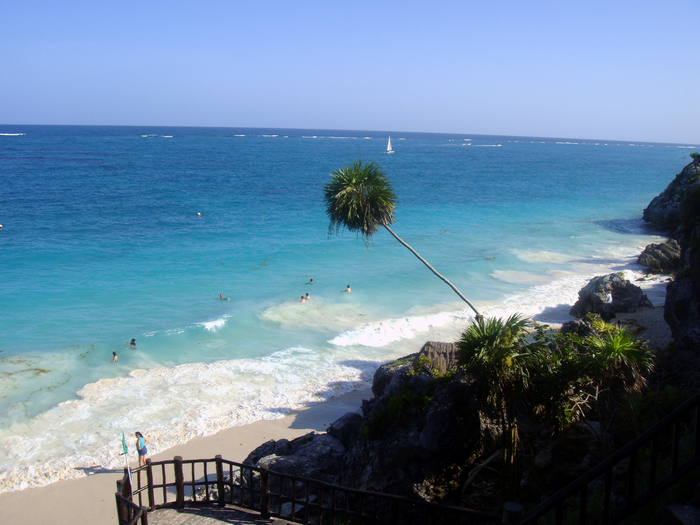 This is what I called “paradise”!! There were a line of people here to take the postcard perfect picture! Finally our turn and this person urggg had his finger in our photo! 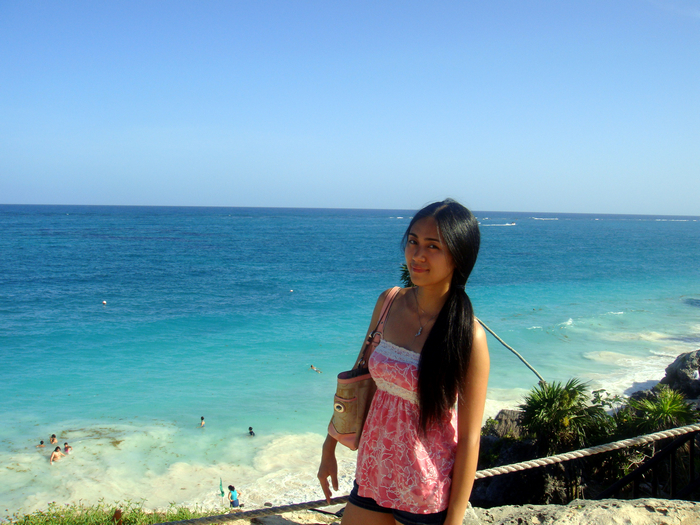 The view was absolutely the most beautiful in Cancun area!!! Our 1.5 hours went very fast with great views! 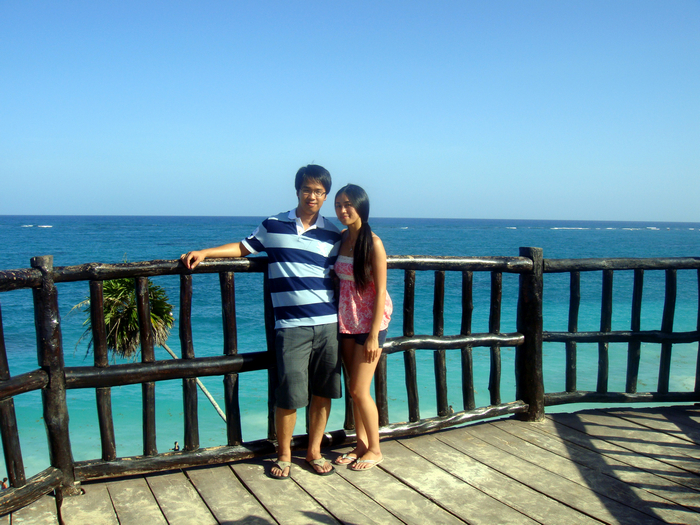 I wish we had more time! 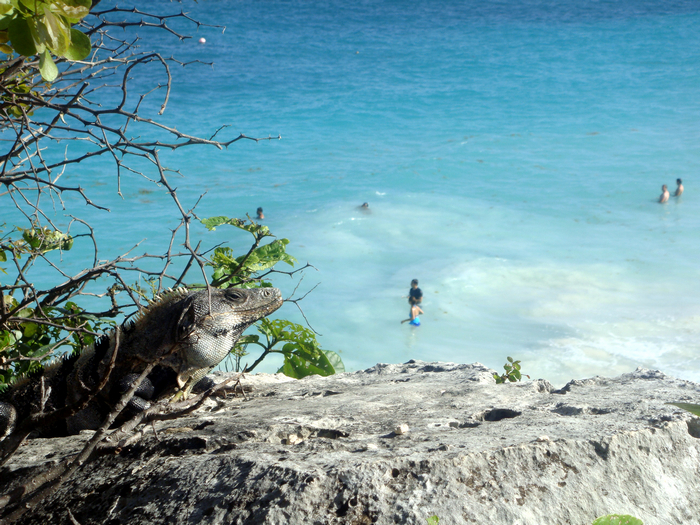 Next trip, we’ll definitely rent a car and come here again! 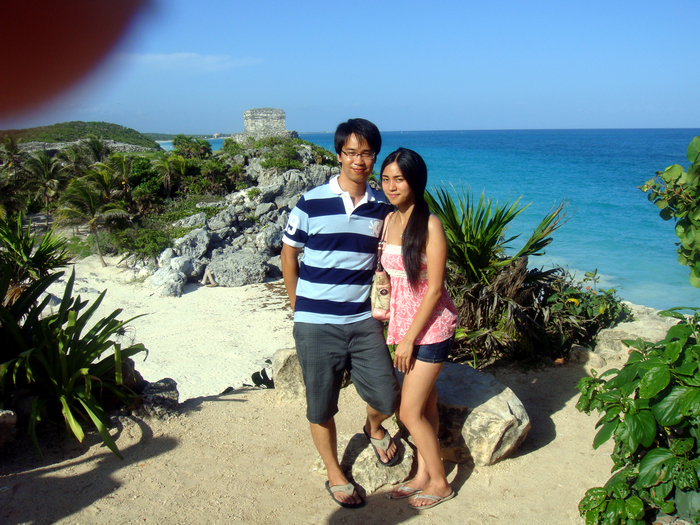 We got back to Cancun at around 7 pm. 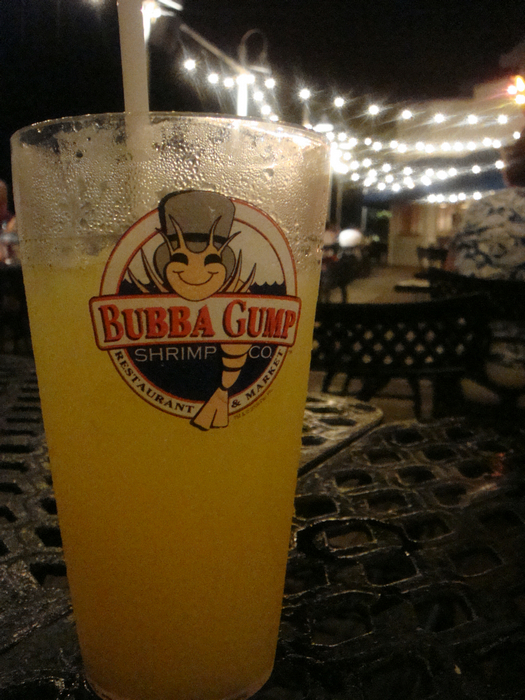 We took the bus to Bubba Gump for all-shrimp meal! 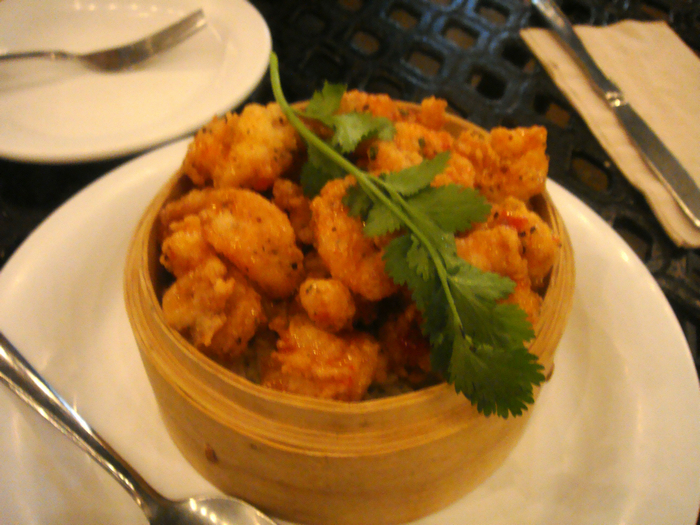 We don’t have this chain in Boston but we tried it out! 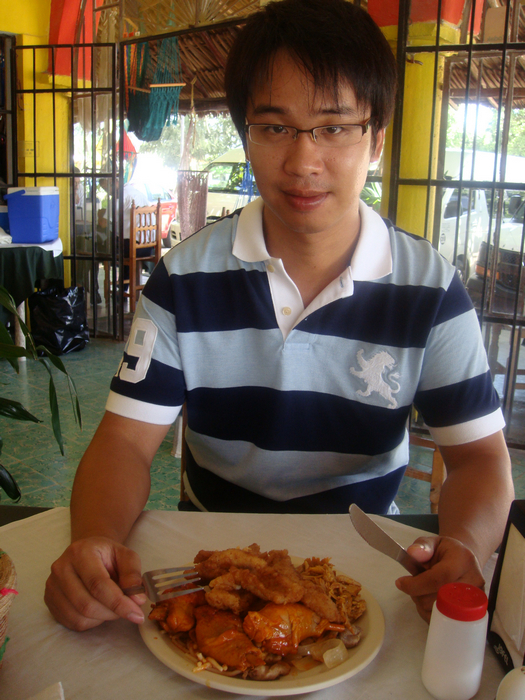 The food was pretty good and reasonably priced since it was a chain restaurant. The sitting area outside was comfortable, don’t forget inspect repellent!